of communists as the new political begins. How do you see the beginning of the political year? 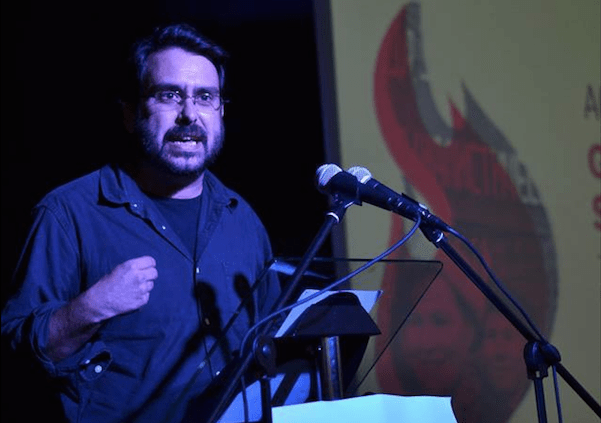 Ástor García: The change in the Government after the motion of no confidence on 1 June has left us a politically really troubled summer which anticipates what I think the two essential keys for class struggle in the new year will be. On one side, it can be seen once again the PSOE Government is not going to be able to satisfy the expectations it generated in large working class and popular sectors. On the other side, the nationalist clash is quickly escalating. I think both factors combined are really worrying. AG: Because the frustrated expectations in some popular strata and the rise of nationalisms can prompt a strengthening of the most reactionary positions, give wings to the fascist groups that are increasingly made more room. But in addition, the two factors I was talking about before demand us a more systematic work which is very clear in the political-ideological sphere, to clash with the social-democrat positions within the ranks of the workers movement and to face an increasingly stronger nationalist speech which is being accepted among the working class. Are these ones the two keys of the political year? The immediate tasks for the PCPE are then an outcome of these keys, is it? AG: Certainly, although the tasks of the Party are totally linked to the tasks the working class has before it in this period. At this moment of identity policies and stances, the development of class conscience is really backward. I mean the working class' one, because it is quite clear for the class enemy. The extreme individualism and idealism the post-modernist ideological positions promote – I must say they are very useful for capitalists – have strongly infiltrated the workers and popular movement, and one of their main effects is a weakening of class conscience, the search for false enemies and thus the strengthening of the real material enemies, those who steal us the result of our work but do not care about our sexual orientation, our skin colour or our birthplace. Therefore it is essential to make an effort of political explanation and organisational proposal is key. The first one to unveil the hoaxes of the “new politics” of social-democracy, the postmodernist positions and the reactionary positions, which just mean to maintain the chains that attach the working majority under capitalism, and the second one to strengthen the capacity of the workers and popular answer against the relentless assaults of the employees and their governments and so the working class, by its own experience in the struggle, sets higher goals, revolutionary goals. What about the specific and the immediate? AG: In the current scene it is crucial not to lose the boost of struggle which was being gained during the months before summer, but which now risks to be gobbled by the arrival of socialdemocracy to Government and the next electoral processes. A big part of these mobilisations were bolstered by the trade unionist forces, but now it seems that union boards are willing to give a vote of confidence to PSOE, so they make again a big mistake and are tremendously irresponsible, because it is not going to be long when we will see PSOE is no ally, but the very opposite. We think that today is the time to bolster the mobilisation and the struggle in workplaces, because the aggressiveness of the employers is not decreasing even though Government has changed, and not the time to give up any struggle and see what social-democracy does. Organisation and unity are the keys to win any battle, and it is time to make an organisational and unitary effort focused on gaining victories in companies, in the main economic sectors, to prove it is the workers' struggle what achieves rights and not the presence of one or another capitalist party in government. Because it is evident that no capitalist government is going to solve the problems the country has. AG: Our country's problems are our working class' ones, those of our working majority that needs two jobs to make ends meet, which does not have enough to pay the electricity or for heating, those of the youth that cannot study higher education or cannot access to a suitable house, those of the pensioners that cash misery and besides help their family, those of women and youngster that earn less for doing the same work. Bourgeois politicians make demagogy about all of this, they promise solutions they are later unable to keep or, if they occasionally relieve problems, are later dismantled to save companies from an economic crisis like the one we have went through. The crisis has had to be paid by workers, as usual, and now what is the most advanced seems to be to recover some of the lost rights. No, it is enough, this infernal cycle must be broken and only the Communist Party can give an effective answer to all this nonsense the Spanish politics is. With “effective answer” I mean to pose a global alternative based on the interests of the working majority and not just some small tweaks to Spanish capitalism which has not widely proved its inability to solve the country's problems, but it is the cause of the country's problems. The end of summer is marked by two important controversies, the exhumation of Franco and the so-called “laces war” in Catalonia, what can you tell us about them? AG: They are one more expression of the nonsense the Spanish politics is. The question on the exhumation of Franco is the evidence that PSOE pretends to overcome its parliamentary weakness through a politics of gestures that, even though they can sound fine at the beginning, they end up showing its class nature. How worthy is it to exhume Franco if at the same time you state José Antonio Primo de Rivera was “a victim of the Civil War”? What do the associations that struggle for recovering the corpses of thousands of murdered by fascism answer to that? It turns out that PSOE is assuming the postulates that equalise victims and executioners, republicans and fascists, and that is really serious and there is no “gesture” that can hide it. What happens with the “laces war” is that the most reactionary sector of Spanish politics and press needed any element to bolster and give consistency to the most chauvinistic positions, once the strategy of the – failed – Catalan independentism does not generate so many headlines and ETA does not exist. And at the same time they strike a new blow to freedom of expression, which is already quite questioned since one fascist can threaten to kill one trade unionist without anything happening and one rapper is imprisoned because of picking on the king. It is also very meaningful there are members of the National Police and the Guardia Civil involved in the “retirement of laces”. But this lace issue must be also understood from another viewpoint, which is that both PP and Ciudadanos need “gestures” that let them recompose their electoral space after the triumph of the motion of no confidence, which has left them out of place. They are competing now to see who is the most Spanish nationalist and that causes an evident collateral effect: more space for ultra and fascist groups, which are feeling at ease with this situation, which have PP and Ciudadanos as their “mass fronts”. We have the example in VOX, which is directly posing the historical programme of Falange and relentlessly winks at the most reactionary sectors of those two other parties. On the other side, there are sections of the Catalan independentism to which this “war” has served them well, because they hold their forces tensioned like that before the “Diada” once the limits of their strategy have been proved. Bourgeois politics is like that, regretfully it traps large sectors of population in controversies that always end up damaging the working majority. PSOE has been in Government for three months. What assessment do you do about it? AG: The same day the motion of no confidence was won our Political Bureau issued a statement posing there could not be one single minute of break to the new Government, because it is a capitalist Government that represents alien class interests. Do you know what happened then? There were people close to us that told us we were rushing, that we had to wait and see... It is fascinating for me the capacity of self-deception some people have, and at the same time the capacity of PSOE to deceive large sectors again and again. Sánchez knows very clearly how to act in the current situation: a politics of gestures towards some sectors so it looks like something has changed while he keeps and reinforces the Spanish capitalist economic base. There is nothing else, and the old communists and new social-democrats of Unidos Podemos have entered in that game as they aim to convince PSOE to apply Keynesian measures to correct some of the most conspicuous and harmful effects of capitalism. We have been in this game for many years and it is required to get out the dead-end road of bourgeois politics. You have mentioned several times the PSOE politics of gestures, can you develop it? AG: Sure. PSOE has to offer something to its voters, or it is going to have it crude in the next electoral processes. And at the same time it has to offer something to let its parliamentary allies sell the support to PSOE has practical outcomes. That is why the exhumation of Franco, the shelter to Aquarius and the letters sent by Work Inspection to companies asking them to not hire fraudulently come up. We have already talked about Franco, but what happened to Aquarius is anthologic. It is evident it was a coup that pursued two goals: inside to make a difference with the PP Governments from the humanitarian viewpoint, and in the international sphere as a means to offer as an ally to some European powers which are required to “legitimate” the new Government. We have quickly seen the migration policies of PSOE are no different to the ones of PP and it seems that removing concertinas is something long forgotten. We warned then when we said the migration policy of the Spanish Government would not alter anything essential and that PSOE would go on applying a deeply class-oriented policy while managing the migratory phenomenon, and this is clearly seen now. As for the letters sent by Work Inspection to companies so they can “correct alleged frauds in work hiring”, ok, 72,000 letters have been sent urging to abide by the law. But they do not even talk about modifying the law that allows such fraud, there is not a single word on changing the Statute of Workers, on repealing the labour reforms, nothing at all... and it does not surprise me, several of them have been made by PSOE itself. Last, let's talk about the electoral processes that are coming soon, is the PCPE going to participate in them? AG: We do not renounce to any space to make the communist proposal known. That is why we are already getting ready to the Andalusian autonomous elections, which seem to be held soon, and the local, autonomous and European elections which will be held on 26 May. We are also watching out in case there are anticipated general elections, which are not discarded. Elections are a side of our political work in which participation makes sense if it helps the goal of developing and strengthening our presence in workplaces and neighbourhoods. Therefore the electoral work is completely subdued to the rest of tasks our 11th Congress set, and we think the presence of communists in the bourgeois institutions must be used to develop the workers and popular movement, to strengthen class positions, not to market with them. It is evident the bourgeois forces are already in campaign, they know they have a lot at stake: PSOE looks for legitimacy, PP for recovery, Ciudadanos for justifying themselves and Podemos for keeping up. These coming up electoral processes are key for the political future of each one of them and that is why we think the political discussion is going to be minimal. Instead, there are going to be many “gestures”, symbolic actions and demagogy in the next months, to try to mobilise different sections of voters. On the other side, far-right organisations like VOX are going to try to fish in the troubled water that Spanish politics is now, and I must say they have it easy in this situation. And on another side, it is more than probable we will go on checking the absolute disorientation of the forces that claim to be communists, both because they submit themselves again to the PSOE and/or Podemos socialdemocracy or because they pretend to become the “left wing” of the system, without posing any serious alternative. In this scene there is a lack of a communist proposal, which we and our candidatures -which will be open to those partners and comrades, even from other organisations, that share with us the need of a radical change in politics and the economy of this country – represent.